What an exciting! Today I would like to share a good news with every body. It is that page turning Maker released new freeware again. Let's cheer for Page Turning Maker's selfless acts, because the program released this time is really powerful and helpful. The program released this time is Page Turning Free PDF to HTML which is designed for making flip book in a few minutes. Free PDF to HTML Interactive Software also allows you to batch convert PDF files to HTML files in seconds. With the standalone and easy to use interface, you just need to add your PDF files or folders what you want, and converting. With Page Turning Free PDF to HTML, you can easily convert any PDF file to Html file in a few steps, that also means you can transfer produces html file to website so that can be viewed via web browser. I believe a lots of people will benefit from this utility program, especially for those who design website. Hurry up! Don't ever miss this grand occasion. 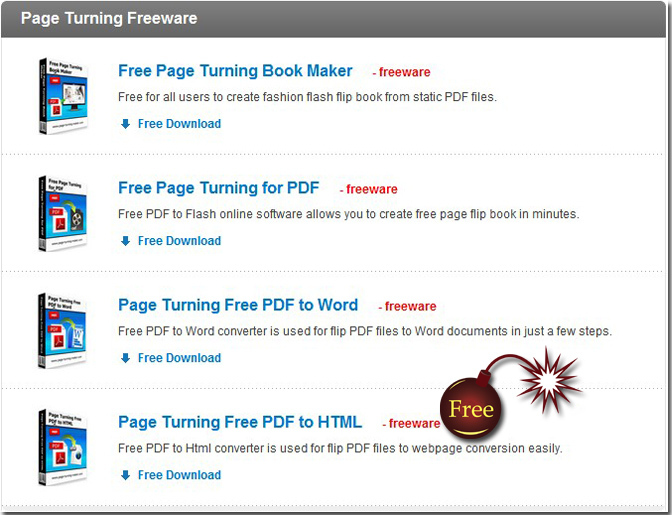 Go to Page Turning Maker instantly and download this freeware to experience its great functions.